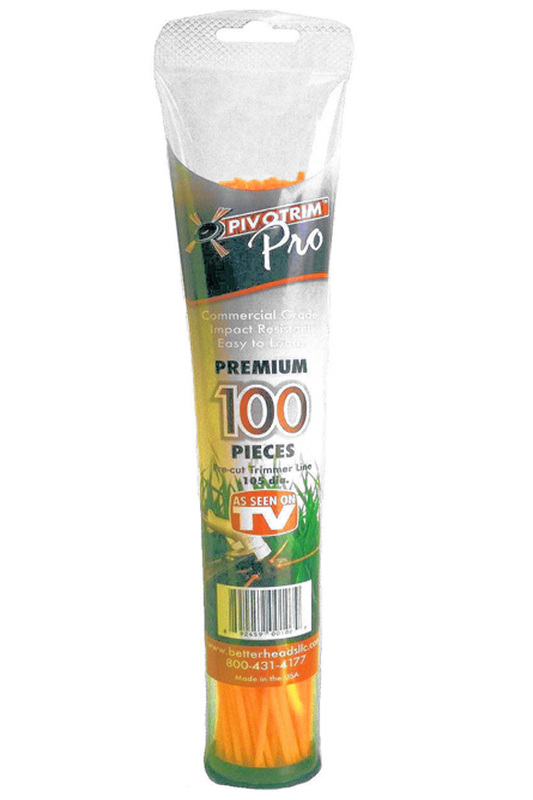 Genuine replacement line for your PivoTrim Pro trimmer head. Easily change the string on your PivoTrim head. This convenient package includes 100 pieces of pre-cut line. It is a thick commercial grade line that is ideal for use with the PivoTrim Pro. This replacement line is a sturdy .105 diameter which means that it will cut great and last a long time. Stop cutting standard line, or searching for the perfect thickness. This convenient package eliminates all of the hassle, guess work, and wasted time associated with cutting your own pieces of line to fit your PivoTrim Pro. 100 pre-cut strips. PivoTrim Pro sold separately. For use with Pivo Trim Pro and other trimmer heads that use pre-cut line. .105 diameter, commercial grade line. Cut to length for fast and easy loading. Uses Re-load trimmer heads that use .105 pre-cut line. Easily replace the string on your PivoTrim Pro Trimmer Head. This 100 strip pack of premium quality, pre-cut line makes it fast and easy. Order Yours Today! Durable, does exactly what they're supposed to do. Work perfectly.